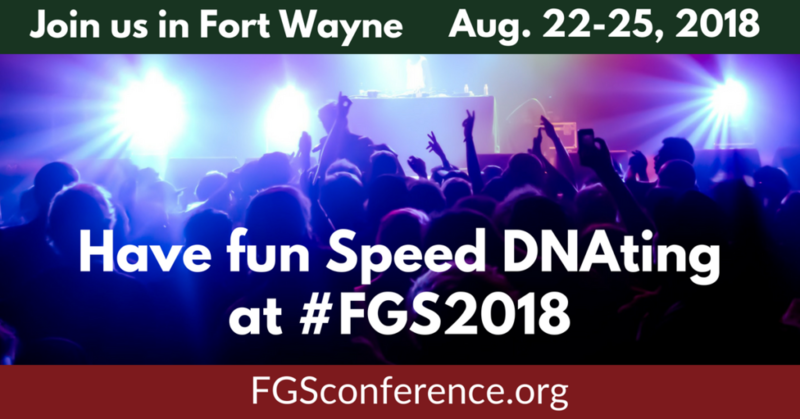 You’re invited to Speed DNAting at FGS 2018! It’s not speed dating — it’s speed DNAting! Join us on Friday, August 24 for an evening of fun and learning all centered around DNA and genetic genealogy. There will be fun, food, drinks, and prizes —including a chance for a consultation with a genetic genealogy expert! You could win a consultation with Blaine Bettinger, Angie Bush, Shannon Combs-Bennett, Crista Cowan, Daniel Horowitz, Judy Russell, Diahan Southard, or Sara Allen. Party-goers… er, we mean, attendees… can take part in trivia contests, win prizes for finding a match in their haplogroup, play DNA bingo, and have fun with a scavenger hunt. What can you win? How do DNA kits sound? Event sponsor Living DNA will also be providing some cool swag for each Speed DNAting attendee! You don’t want to miss this! This isn’t a lecture — it’s an event!